Mary's List: Some Good Ones! I just loved The Way Way Back. It’s a movie from the perspective of a teen-aged boy named Duncan played nicely by Liam James who’s on vacation at a beach town with his mother and her jerky boyfriend (Steve Carrel can play a jerk, who knew?). The girl next door calls it spring break for adults. The adults in his world mainly seem messed up or too self-involved to see Duncan until he makes his way to the water park where he meets the wacky owner Owen played by Sam Rockwell. Owen introduces Duncan to silliness and fun. 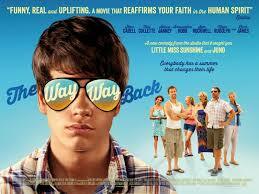 Maybe The Way Way Back isn’t one of the most original movies there ever was, but it sure is one of the most fun. I can’t remember a movie that I laughed as hard as I did or genuinely rooted for the main character as much as I did. Blue Jasmine didn’t seem like a typical Woody Allen movie to me. There are comical over the top characters like in most of his films, but I think it is Cat Blanchet’s role as a modern Blanche Dubois that gives the movie more resonance than a typical Woody Allen movie. Blanchet is just plain mesmerizing in this movie. I also liked Sally Hawkins who is the delightful British actress from Happy-Go-Lucky. Some of the other characters, particularly the brutish male clichéd roles kind of bugged me. But overall I really liked Blue Jasmine. 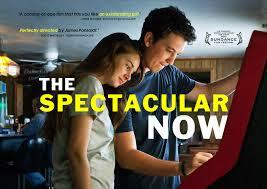 I saw The Spectacular Now today. It’s a sweet movie about a pair of mixed up teenagers who both have mixed up family situations and find solace in the other. Miles Teller plays Sutter, a surprisingly young full blown alcoholic who plays a very sad smiling life of the party. Teller is so good in the movie that I hope he will be nominated for an Oscar. Despite the fact that I left the theater today feeling really sad, I’m glad I saw this movie with great acting and good story telling (although I’m a bit confused by the ending).